Logical Gal – who’s to judge? Beware of facile slogans that slip off the tongue! But is that ALL the Bible says? How does a Logical Gal or Guy think about this? What questions would he or she ask? First of all, we need to look at not just ONE Bible verse, but others, to see if one or more concepts might be in question. If the term is the same but the concept is different, then a fallacy might be lurking! Just a few verses further along from that famous one-liner is this instruction about judging: ” You hypocrite, first take the log out of your own eye, and THEN you will see clearly to take the speck out of your brother’s eye.” (Matt 7:5) That sure sounds like we ARE to judge, once we get ourselves squared away. 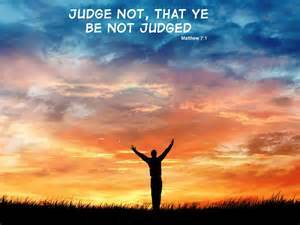 There is one group of people whom God commends for being skeptical and judging BY the standards of the Bible. They practiced discernment, a form of judgment. They did not take what they heard at face value, but ‘judged’ rightly. 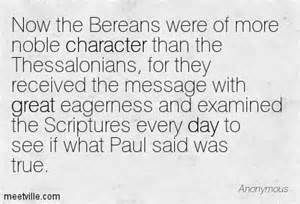 These men and women were the Bereans. (Acts 17:11) They listened to new teachings and judged or filtered them by God’s grid of righteousness. They WERE judgmental and were held up as an example for us to emulate. They would have told Paul to his face, courteously but directly, that he was WRONG had his teaching NOT lined up with the Bible. That’s being pretty ‘judgmental’ by today’s shallow standards. So the next time someone tosses in your face that bit of trite bumper sticker ‘wisdom’ about judging, just ask them politely: Why? and then wait for them to fill the airspace. 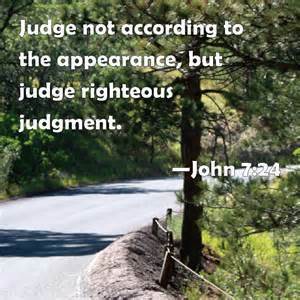 And if they say, “Because it’s WRONG to judge!” Ask them “Who says?” and then be prepared to show them what Jesus taught!